This trick solve a common OTG (On -the- Go) error while connecting a USB device to a phone. 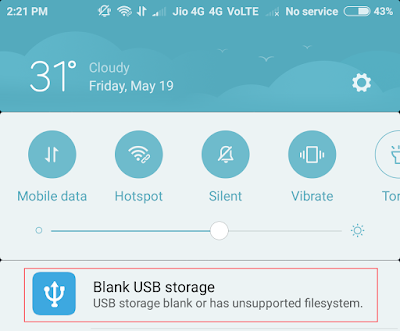 USB Storage Blank or Has Unsupported File System is an OTG connecting error even your phone and pen drive have no complaints. This error commonly shown in Red MI devices like Red Mi Note 3, Samsung Galaxy Note, Tab, HTC one, etc. There are many types of memory systems such as NTFS, exFat, FAT32, etc. Normally or some mobile phone and Tablet support only FAT32 file system and this error arises due to incorrect USB memory type, means your pen drive format is not FAT32 or your phone does not support the memory format of your pen drive. Solving this error is very easy. You just format your pen drive with FAT32 memory format type. You will lose all your data while formatting, so take a backup of your files on your computer or in another device. 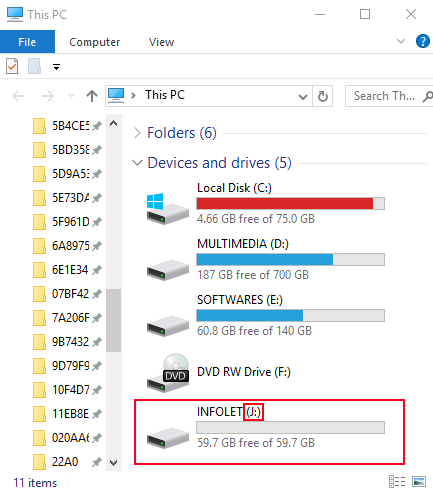 Sometimes file explorer software like ES File Explorer supports opening file systems else than FAT32. So try to install and open your OTG pen drive using such software. Some phone support formatting the device even your phone can’t open it. Just go to setting and storage option. There you must see your USB OTG device, select and format it. Normally mobile phone format memories with FAT32. If you can’t see format option, then you must go to another method. 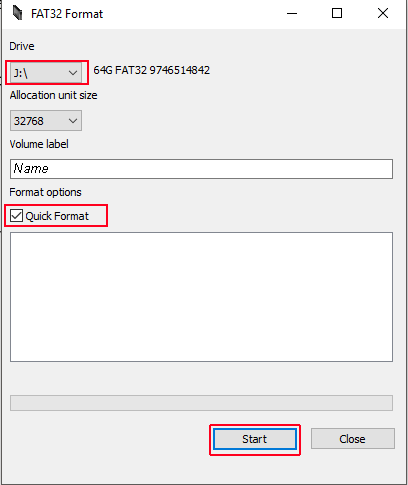 This is the perfect, simple and fast method for formatting a device with FAT32. Just connect your pen drive or USB device to a computer. Unfortunately Windows OS default formatter does not support formatting device with FAT32. They support only NTFS and exFAT. So you just download this light weight software named FAT32 Format for getting FAT32 device. Select your device drive letter. Just open your computer to confirm. Selecting allocation and giving device names are optional. Now just click on ‘Quick Format’ button. You will get formatted within seconds. Now your memory device is ready with FAT32 format. Just connect to your phone and now you can access your memory without any error. You can format your device with your Windows Command Prompt (DOS). Open your run (Window key + R). Or directly search for ‘cmd’ in start menu. Where X is your memory device letter that you can see at compute explorer. Look at method 2. Now wait until the process is completed. This method takes much time depending your memory size. This method does not work with memory size more than 32GB. As a conclusion the method 32 is perfect and fast.